Manufactured by AET Solar, exclusively for GreenTech. 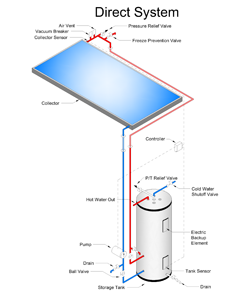 Direct systems are used in Tropical climates and may be adapted to the customers existing hot water tank.The system is referred to as Direct because the Suns's heat is transferred through the Collector directly to the useable water. When there is sufficient heat in the Collectors, a pump circulates water from the bottom of a storage tank through the Collector where it is heated, and then returns to the tank for storage and eventual use. A differential control senses differences between water leaving the collector and the coldest water in the bottom of the storage tank. When the temperature of the water in the Collector is hotter than the water in the tank, the differential control operates the circulating pump.